As Singapore restructures its economy, there may be pain for workers in some industries, but Finance Minister Heng Swee Keat says the Government will support them as they adjust to the new environment. Companies also have to pitch in and work together with their staff and the Government on this effort. This is important as some industries may not do as well as others, and the workers affected may need to seek new opportunities elsewhere, he said in an interview last week, where he underlined the need for workers, bosses and public agencies to work together as Singapore faces a more challenging global economy. "You need the effort of the workers, you need the effort of the companies, and you need the government agencies to support it in the right direction," he said. Mr Heng made the remarks at his first extensive interview since returning to work in August, after he suffered a stroke in May. He acknowledged that workers are anxious about jobs and the economy in the near future. "The fact that Singaporeans are concerned is a sign that we are serious people, and that we do want to make preparations," he said. "We need to turn that anxiety into action that will prepare us better for the future," he added. "It is not easy, I appreciate that. But if we provide a support system, and if we support one another as fellow workers, as employers, we can make the grade." 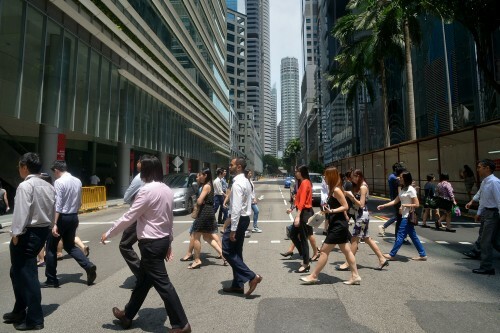 While Singapore's unemployment rate is still low at 2.1 per cent as of September, manpower data for the third quarter showed high lay-offs and a widening gap between job seekers and job openings. For the first nine months of the year, 13,730 workers were axed, the highest level since 2009. More people who were out of a job also took longer to find work, and there were 91 job openings for every 100 unemployed people as of September. The worst-hit were workers in the construction, marine and offshore-related industries, due to the protracted slump in oil prices. Mr Heng chairs the Committee on the Future Economy (CFE), which has consulted widely over the past year and come up with recommendations for Singapore to stay competitive. The committee will release its report early next year and is expected to identify areas for growth where people and companies can seize opportunities. Mr Heng said the Government is also helping workers across all sectors with schemes to ease their transition into the new economy. These include Aspire, now part of SkillsFuture, to ensure that there are avenues for people to build on skills as they progress in the workforce. He also cited the $4.5 billion Industry Transformation Programme announced in this year's Budget. Among other things, it gives grants to small companies looking into automation to scale up their business. Mr Heng is encouraged by the confidence of corporate chiefs he met during the CFE meetings. Despite the weaker economic environment, they told Mr Heng that "we do have strengths and it is important that we build on those strengths". "That sense of confidence and optimism that we can do it is an important asset," he said.